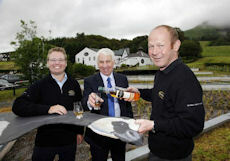 Glengoyne Highland Single Malt will become the exclusive whisky partner of the Wildfowl & Wetlands Trust (WWT) in time for the official opening of a brand new wetlands area onsite at the Distillery, which will help with processing distillery waste and make the area a haven for wildlife. Glengoyne Distillery has invested £170k on the facility which deals with the effluent from the spirit stills called Spent Lees. This reduces waste by around 25% and deals with it in an environmentally friendly manner. The wetland plants were bedded in early May to acclimatise and have now begun processing waste liquid from whisky making. 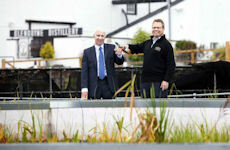 As a further commitment to wetlands, the distillery has promised a minimum contribution of £5,000 to WWT in the first twelve months of the long term partnership, to be raised through contributions from sales of special bottles. Glengoyne will donate £3.00 on all personalised bottles and £4.50 on all standard bottles of the core range purchased online using a special code available to WWT members. The agreement will also see other joint marketing and fundraising initiatives with the charity including limited edition bottlings, discount on WWT membership, on-pack promotions and joint events. The partnership kicked off in early June with a special Father’s Day promotion. Robbie Hughes, Distillery Manager at Glengoyne said: “We are always looking at options for improving our waste management and wetlands seemed like the perfect solution. It allows us to reduce waste, cut down on waste transportation, be more environmentally friendly and will attract a huge range of wildlife to the area, which is already renowned for its geese. “We are also investigating further environmental improvements including Anaerobic Digesters to generate gas for our boiler from another one of our effluent streams.” WWT is a leading UK conservation organisation saving wetlands for wildlife and people across the world by creating, restoring and monitoring wetlands and the wildlife that depends on them. Wetlands are among the world's most productive environments and support great biodiversity. They are, for example, havens for birds from storks to swans and ducks to divers. Glengoyne Distillery is situated just 30 minutes outside Glasgow, in the Trossachs National Park at the start of the West Highland Way and has been producing exceptional single malt whisky for nearly 200 years.